It was really fun. I like being challenged and love doing research. I didn't go to in-depth this time but it did still take some work to find items for all my themes each day. I did find some awesome bloggers that I will continue to follow! I think I'll do another post with an A to Z blogroll. My favourite parts were playing with photos from my personal collection and friends for the 'country of the day'. My theme was sort of an 'evening in' with a wine, cheese and fruit plus a book, music album and movie of the day and then added the country of the day just before it started. Thanks to various wikis I could do the research fairly easily. Some letters had more options to play with, though. I turned off CAPCHA and got no spam comments myself. Most blogs did not have CAPTCHA on. I do it anyway. I like the challenge of trying to get those things right. :P And sometimes they make me laugh. I plan to do it next year. It will probably be very different. I'm fairly new to blogging so still finding my voice. This was an experiment for me in a lot of ways. So, there you have it. Good times had by all! I don't think I ever saw this blog during the Challenge, but it certainly sounds like a great theme. Very creative. Well, thank you for stopping by! I'm with you on the "obsessively checking stats" thing. Still doing that! Gah! I like your idea of each URL being accompanied by a brief description. Another idea that's been floating around is categorizing blogs, so folks can direct their commenting/following energies towards things of interest to them - I think this would be great! Somehow I missed this blog during the challenge but will make amends for that. I also turned off comment moderation and have been pleasantly surprised by the lack of spam. My main reason for having it was so that I'd get an email notifying me of new comments. Turns out Blogger do that anyway and their spam filtering is pretty good too. Welcome 'here'! 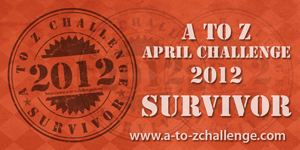 I still have tonnes of blogs to visit from the challenge, too. Yeah, blogger is pretty good for stuff like that. I just wish they had more specific/historical stats available.